Happy Autumn, everyone! 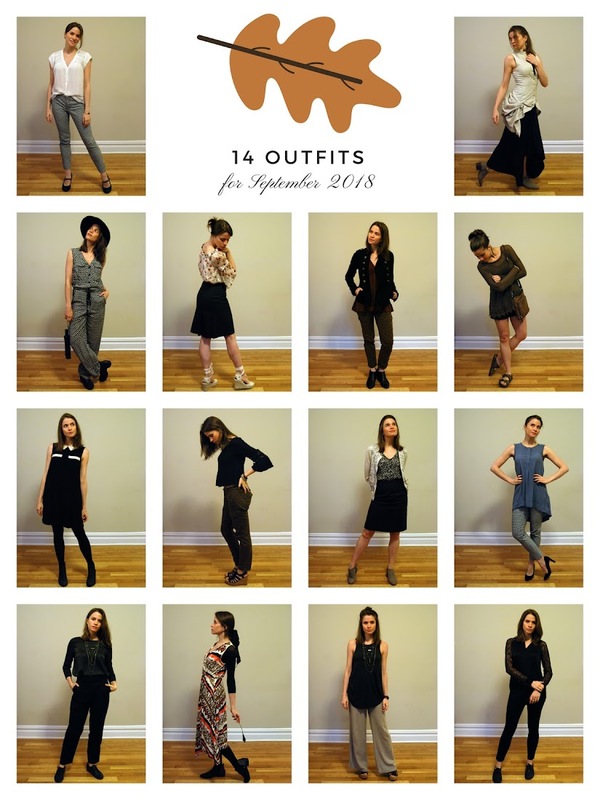 It's bittersweet to announce that this is my twelfth and final sampler wardrobe outfit post. I've kept up the process for exactly one year (see this page for the archives! ), and while I intend to continue exploring wardrobe construction and personal style, to post another series of lookbook photos would soon prove redundant. After all, the purpose of this whole process was to wear less, more often. Especially in the case of my work wardrobe, which has really become a true capsule now, you've seen just about every outfit combination I've come up with! Employing and fine-tuning this method of wardrobe minimizing was so fun for me. I learned a great deal about what shapes & fabrics I love, what kind of uniforms I gravitate toward, and what color palettes already exist in my closet. The great thing is, now I have a full year's worth of photos to use in further analysis and discussion! So expect to see future posts detailing what I learned throughout the sampler process. Without further adieu, let's dive into my September wardrobe! As you may be able to tell from these shadowy photos, our daylight is quickly fading -- a clue that cooler weather is finally upon us! We New Yorkers have been patiently (and sometimes not-so-patiently) waiting for the humidty to die down, and in the past two weeks our dreams finally became a reality. I felt pretty clever outsmarting my own autumn-obsessed brain, reminding myself that sleeveless options still take precedence over cozy cover-ups in city-September. But when I woke to a 65-degree morning last week, I was grateful for the sole jacket I'd included! Stepping out of summer meant banishing white from my wardrobe -- not because I care about all that Labor Day mumbo-jumbo, but because it was necessary to make room for all the black. Devotion to this non-color runs back about three generations of women in my family, and try as I might I've never been able to abandon it entirely. In summer, I avoid black for obvious reasons, so when it comes to lighter transitional items (i.e. the crochet-sleeve boho blouse, black shorts, and military button jacket), I have to make the most of them during this brief period. One thing that's been really exciting about the sampler process overall is mastering how to identify & maintain a palette. I've never had much success subscribing to set colors in the past, but I finally feel like I've hit upon the secret (which I'll share in a future post.) With the exception of that pop of blue in my work wardrobe (hello, summer holdover! ), I've got a nice mostly-neutral thing going here: black, taupe, olive, and cream, plus some orange-y accents for interest. Mmmm... fall. 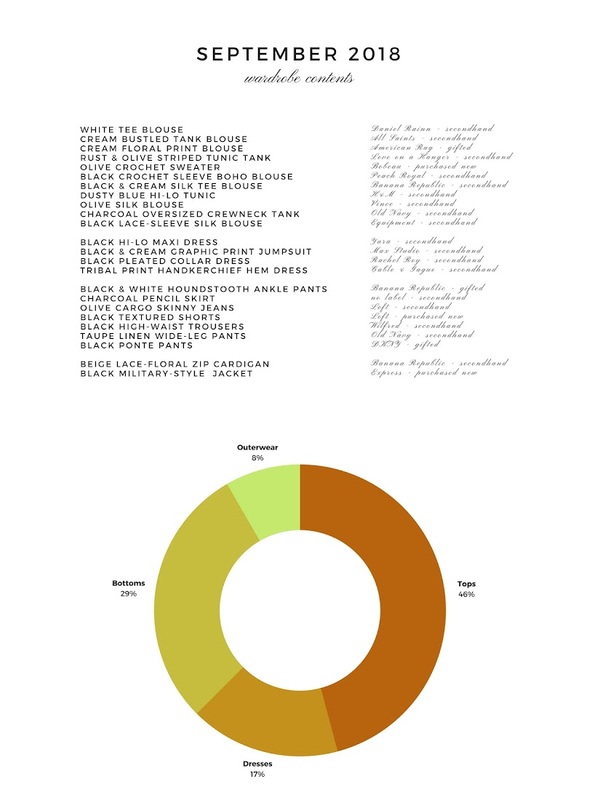 A mere 24 garments made up this month's capsule, which I believe is my record for the year. It's satisfying to think that in this last week I was still jotting down new outfit combos to parade around before month's end. That's the beauty of mindful limitation -- it often serves your creativity even more than boundless freedom! I hope that the sampler wardrobe experiment has been useful to some of you on your own style journey. As mentioned, check back soon for future tips and analysis on the sampler year as a whole. Thanks for tuning in!